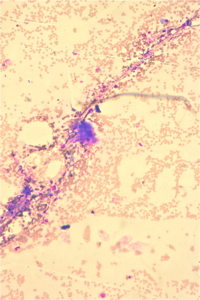 Osteoclast are multinucleate bone resorbing cells derived from the haemopoietic stem cell. 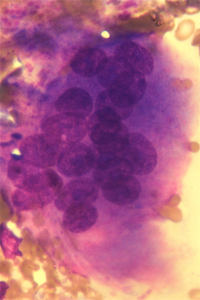 An osteoclast is about 30-100μ in size and has multiple discrete oval nuclei. They have azurophilic granules. 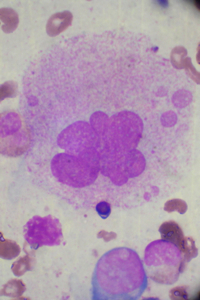 The megakaryocyte though a large cell, unlike an osteoclast, normally has a single multi-lobed nucleus. 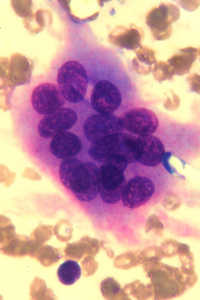 Osteoclasts are truly multinucleate. The azurophilic granules of osteoclasts are coarser.